1. Have at least 12 glasses of water daily. Include juices daily too. 2. Go low on oxalate rich foods : This includes peanuts, some leafy vegetables like spinach, beet, chocolate, sweet potato, yam, sesame seeds, wheat germ, ladies finger, coffee and tea. 3. Reduce the intake of sodium : Sodium is a part of table salt, canned foods, breads, pickles, packaged foods and some types of seasoning too. 4. Limit the animal protein : All non-vegetarian foods must be replaced with pulses and legumes which are comparatively low in oxalate content. It’s best to check with your doctor / dietitian on the amount of actual protein consumption. Do not cut down on milk completely. Have it in the form of curd – it’s the best probiotic you can give your gut. 5. Do not avoid the calcium completely: It’s a myth that calcium needs to be curbed off. Instead focus on pairing calcium with the little oxalate you eat so that they bind during digestion, before reaching the kidney for excretion. 6. Eat a lot of watery foods : Fruits and veggies like cucumber, watermelon, orange, pomegranate etc. will be of added benefit to flush of the kidneys. 7. Avoid alcohol, tea and colas. 8 Causes of kidney Stones? 1. Lack of water intake: This is the most common cause of kidney stones. When the intake of water is below 2 litres a day, the urine becomes more acidic, thus causing the formation of stones. 2. Infection of urinary tract: Urinary tract infections contribute to pus cells around which stones are likely to be formed. 3. Hereditary : Inherited metabolic renal disorders may predispose to renal calculi. 4. Dietary factors : A diet high in salt, sugar and protein may increase the risk of stones at times. A very high sodium diet, which is seen with extremely high salt intake or the intake of ready-to-eat and canned foods increases the amount of calcium kidney filter thus causing stones. 5. Obesity: Being obese, having excess belly fat and weight gain is also one of the cause of kidney stones. 6. Dearth of chemicals in urine : Normally urine contains chemicals which doesn’t allow crystal formation in urine. However if these chemicals don’t work, stones develop. If the crystals are small they will pass out of the tract by way of urine unnoticed. However if the stones formed are big, they are the cause of extreme pain. 7. Other medical conditions : Renal diseases, Crohn’s disease, hyperthyroidism, gastric surgery etc. may also be a cause of kidney stones. 8. Climatic conditions: People who stay in extreme hot climatic regions or work for hours directly under the sun, perspire a lot and thus pass a highly concentrated urine. 1. Calcium stones : The most common type of kidney stone is the calcium oxalate. Oxalate is a naturally occurring substance found in may food sources and also produced by the liver. A high consumption of oxalate rich foods, some types of surgeries etc. may increase the risk of these type of stones. Another type of calcium stone is calcium phosphate stone, though not so common. 2. Struvite stones: These are usually is response to urinary tract infection. 3. Uric Acid stones: A high protein diet or a diet lacking water usually causes uric acid stones. 4. Cystine stones: Some hereditary disorders cause excretion of excess cystine causing stones. This is very rare though. 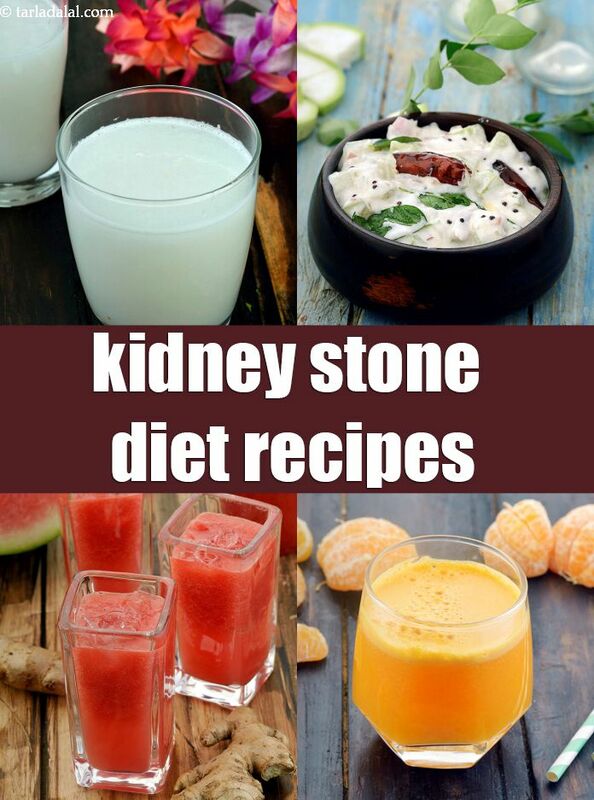 Here are a few recipes to opt for while suffering from calcium oxalate stones. However since most kidney related diets are individualistic, we recommend you concern your doctor / dietitian before devouring these recipes.